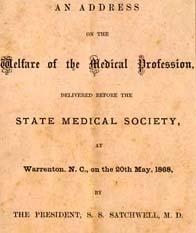 S. S. Satchwell (Solomon Sampson), 1821-1892 An Address on the Welfare of the Medical Profession, Delivered Before the State Medical Society, at Warrenton, N. C., on the 20th May, 1868, by the President, S. S. Satchwell, M. D.
Wilmington, N. C.: Engelhard & Price, 1868. Medicine -- Practice -- North Carolina. Physicians -- Professional ethics -- North Carolina. Quacks and quackery -- North Carolina.